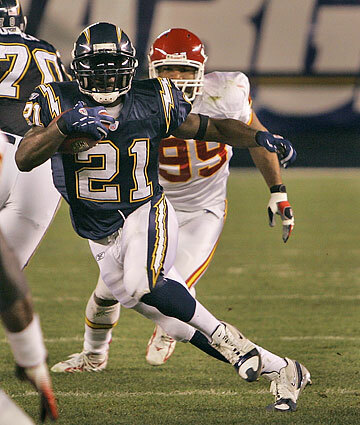 LaDainian Tomlinson, left, was one of nine Chargers picked to the AFC squad. NEW YORK » The San Diego Chargers and Chicago Bears lead the NFL in wins -- and Pro Bowlers. The Chargers placed nine players on the AFC squad yesterday and the Bears had seven on the NFC team, which also includes a quarterback -- Dallas' Tony Romo -- who wasn't a starter when the season began. San Diego's contingent includes record-setting running back LaDainian Tomlinson and quarterback Philip Rivers, who sat on the bench for his first two seasons behind Drew Brees. The former Chargers quarterback signed as a free agent with New Orleans in the offseason and will start for the NFC. Also among the players representing the Chargers is linebacker Shawne Merriman, last year's defensive rookie of the year, who made it despite missing four games for flunking a steroid test. "I'm very proud of our team and players," said general manager A.J. Smith of the Chargers, who like the Bears are 12-2. "We have a special group of players. These individuals are being recognized, but this is also a positive reflection on their teammates and the overall strength and depth of the entire roster." Tomlinson is the biggest star of the bunch, having set the single-season records for touchdowns and scoring with two games remaining. The game will be played at Aloha Stadium on Feb. 10. Chicago's representatives demonstrate how the Bears won: with defense and special teams. Three of the seven Bears, led by linebacker Brian Urlacher, are on defense and three are on special teams -- kicker Robbie Gould, specialist Brendan Ayanbadejo and rookie return man Devin Hester, who has shattered records with six returns for touchdowns on three punts, two kickoffs and a missed field goal. Center Olin Kreutz, a St. Louis School alumnus and a perennial at his position, is the only Bears Pro Bowler on offense. The NFC team also includes the Barber twins -- running back Tiki of the New York Giants and Ronde of Tampa Bay. The first twins to make it together, they now become the second set of brothers to make the Pro Bowl for three straight seasons -- Shannon and Sterling Sharpe from 1993 to '95 are the others. Saint Louis School product Olin Kreutz -- snapping to Daunte Culpepper prior to the 2005 Pro Bowl -- was one of seven Bears chosen to the NFC team. "With this being my final season in the NFL and the final time my brother Ronde and I will be teammates, the honor carries even more significance than in previous years," said Tiki Barber, who described himself as "emotional and ecstatic." In a year of outstanding rookies, Hester is the only one to make it, although Tennessee quarterback Vince Young is an alternate. And Romo is almost a rookie. Until this season, he hadn't thrown a pass in three seasons with Dallas, mostly as a third-stringer. But he is 6-2 as a starter since taking over from Drew Bledsoe at halftime of a loss to the Giants, leading the team to a playoff berth and control of the NFC East. When his potential selection to the Pro Bowl came up after his fourth start, coach Bill Parcells called it "ludicrous." Like Kreutz, Urlacher and the Barbers, many of the Pro Bowlers are perennials although Ray Lewis of the Ravens didn't make it -- beaten out at inside linebacker on the AFC roster by Al Wilson of Denver and Zach Thomas of Miami. One non-perennial is Reggie Wayne of the Colts, one of the league's best receivers for the past few years but always in the shadow of Marvin Harrison and never before a Pro Bowler. "I really didn't think he would make it, not that he didn't deserve it," Colts coach Tony Dungy said. "But it's a tough perception to overcome -- that your No. 2 receiver is better than 28 other receivers in the league." Harrison also made it, although he is a backup to the two Johnsons who will start at wide receiver -- Chad of Cincinnati and Andre of Houston. Buffalo linebacker Aaron Schobel and Pittsburgh running back Willie Parker are two of the nine first-time selections on the AFC squad, including Rivers and Wayne. "From this day on, I guess I'll always be remembered as a Pro Bowler," Schobel said. "That's something nobody can take away from me." Arizona safety Adrian Wilson joined 12 others, including Romo, Hester, Gould, San Francisco running back Frank Gore and St. Louis running back Steven Jackson as first-timers on the NFC team. Wilson said he got a phone call from Cardinals vice president Michael Bidwill yesterday afternoon. "I had to go in the closet because I didn't want to scare my son," Wilson said. "I was pretty ecstatic." The position with the most repeaters is traditionally the offensive line. Guard Will Shields of Kansas City will go for the 12th time, tying a mark held by former Viking Randall McDaniel, also a guard. Another guard, Pittsburgh's Alan Faneca, will represent the AFC for the sixth straight time. The AFC quarterbacks in addition to Rivers are the Colts' Peyton Manning, who'll start, and the Bengals' Carson Palmer. The Rams' Marc Bulger joins Brees and Romo as the NFC's quarterbacks. Dallas punter Mat McBriar, a University of Hawaii alumnus, was chosen yesterday as the NFC's punter for the Feb 10 Pro Bowl at Aloha Stadium. A third-year pro, McBriar was with the Warriors from 2000 to '02. He leads the NFL in punting with a 48.3 average on 51 punts. Chicago center Olin Kreutz, a Saint Louis School alum and nine-year veteran, will play in his sixth Pro Bowl. Wide receivers -- s-Andre Johnson, Houston; s-Chad Johnson, Cincinnati; Marvin Harrison, Indianapolis; Reggie Wayne, Indianapolis. Tackles -- s-Willie Anderson, Cincinnati; s-Jonathan Ogden, Baltimore; Tarik Glenn, Indianapolis. Guards -- s-Alan Faneca, Pittsburgh; s-Will Shields, Kansas City; Brian Waters, Kansas City. Centers -- s-Jeff Saturday, Indianapolis; Nick Hardwick, San Diego. Tight ends -- s-Antonio Gates, San Diego; Tony Gonzalez, Kansas City. Quarterbacks -- s-Peyton Manning, Indianapolis; Carson Palmer, Cincinnati; Philip Rivers, San Diego. Running backs -- s-LaDainian Tomlinson, San Diego; Larry Johnson, Kansas City; Willie Parker, Pittsburgh. Fullback -- s-Lorenzo Neal, San Diego. Ends -- s-Aaron Schobel, Buffalo; s-Jason Taylor, Miami; Derrick Burgess, Oakland. Interior linemen -- s-Richard Seymour, New England; s-Jamal Williams, San Diego; Casey Hampton, Pittsburgh. Outside linebackers -- s-Shawne Merriman, San Diego; s-Adalius Thomas, Baltimore; Terrell Suggs, Baltimore. Inside linebackers -- s-Al Wilson, Denver; Zach Thomas, Miami. Cornerbacks -- s-Champ Bailey, Denver; s-Rashean Mathis, Jacksonville; Chris McAlister, Baltimore. Strong safety -- s-Troy Polamalu, Pittsburgh. Free safeties -- s-Ed Reed, Baltimore; John Lynch, Denver. Punter -- Brian Moorman, Buffalo. Place-kicker -- Nate Kaeding, San Diego. Kick-return specialist -- Justin Miller, New York. Special teamer -- Kassim Osgood, San Diego. Wide receivers -- s-Torry Holt, St. Louis; s-Steve Smith, Carolina; Anquan Boldin, Arizona; Donald Driver, Green Bay. Tackles -- s-Jammal Brown, New Orleans; s-Walter Jones, Seattle; Chris Samuels, Washington. Guards -- s-Shawn Andrews, Philadelphia; s-Steve Hutchinson, Minnesota; Larry Allen, San Francisco. Centers -- s-Olin Kreutz, Chicago; Matt Birk, Minnesota. Tight ends -- s-Alge Crumpler, Atlanta; Jeremy Shockey, New York. Quarterbacks -- s-Drew Brees, New Orleans; Marc Bulger, St. Louis; Tony Romo, Dallas. Running backs -- s-Frank Gore, San Francisco; Tiki Barber, New York; Steven Jackson, St. Louis. Fullback -- s-Mack Strong, Seattle. Ends -- s-Julius Peppers, Carolina; s-Will Smith, New Orleans; Aaron Kampman, Green Bay. Interior linemen -- s-Tommie Harris, Chicago; s-Kevin Williams, Minnesota; Kris Jenkins, Carolina. Outside linebackers -- s-Lance Briggs, Chicago; s-DeMarcus Ware, Dallas; Julian Peterson, Seattle. Inside linebackers -- s-Brian Urlacher, Chicago; Lofa Tatupu, Seattle. Cornerbacks -- s-Ronde Barber, Tampa Bay; s-DeAngelo Hall, Atlanta; Lito Sheppard, Philadelphia. Strong safeties -- s-Adrian Wilson, Arizona; Roy Williams, Dallas. Free safety -- s-Brian Dawkins, Philadelphia. Punter -- Mat McBriar, Dallas. Place-kicker -- Robbie Gould, Chicago. Kick-return specialist -- Devin Hester, Chicago. Special teamer -- Brendan Ayanbadejo, Chicago.